Learn about FIFA 19's game mode: Division Rivals, under the FIFA Ultimate Team aka FUT Mode! Check out what is Division Rivals, its mechanics, rewards, and more. What Is FUT Division Rivals? 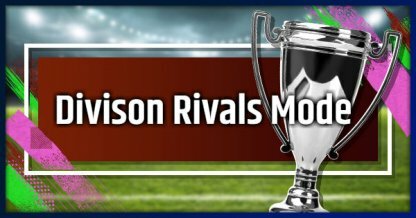 Division Rivals is a game mode within FIFA Ultimate Team or FUT Mode that lets you compete against other FIFA 19 players online! This game mode spans over a week. After the week has run its course, you will be given a reward of your choice. Stats will then reset, and you can play again to earn more rewards! 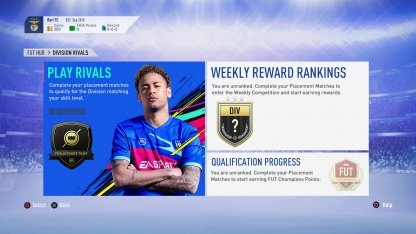 Looking at the rewards page in FIFA 19 itself, it seems as if you will compete in four matches, each win rewarding you with a point. These points correspond to your rank within your Division. DISCLAIMER: This section of the article will be updated as soon as more information regarding the number of matches is confirmed. There are some rewards within Division Rivals that offers you a choice between three different rewards. Choose the reward you want to receive instead of leaving it up to chance! To earn your rewards, you will need to compete against players. To make sure that matchmaking is balanced, you will compete against players with similar skill levels via the Division you are assigned to. Division Rivals can also serve as your ticket to competing into the Weekend League, another online game mode for FIFA 19. Some of the rewards will grant you points that let you qualify for the Weekend Leagues, but you have to work for it! In order for you to qualify for the FUT Champions aka Weekend League Game Mode, you will first need to earn 2,000 FUT Champs Points. Below is a table that shows the different rewards that you can choose per rank. FUT Coins multiply depending on your Division. The number at the left of the table represents your rank in the division. Your FUT Champs Points will increase the higher your division. Below is a table that shows the FUT Champs Points multiplier per Division. Your rewards are based on how well you have performed throughout the week. The better you perform in your division, the better your rank, and in turn, your rewards will be! Higher Divisions will most likely give better rewards. For example, Division 1 will give more FUT Champs Points than Division 10. Try to improve your game to get better rewards! Divisions are populated with players of the same Skill level. This was done so that matches do not easily become one-sided. This can also help you improve as a player since you are playing at your own pace. In order for the game to calibrate your Skill level, you will need to play a few placement matches. Based on your wins, losses, stats, and more, you will be placed in your division. Your performance during matches within your division will dictate whether you move up a division, stay, or get demoted. Better performances will promote you, while performing badly will get you demoted.